The practice of dedicating a day to honoring America’s war dead has its roots in the years immediately after the Civil War — though it wasn’t until 1971 that Memorial Day was officially declared a national holiday by Congress to honor the fallen of all wars. The day will be an intensely personal experience for many veterans of the Iraq and Afghanistan conflicts — about half (47%) said that they served with a comrade that had been killed, according to a Pew Research Center survey of veterans conducted in 2011. 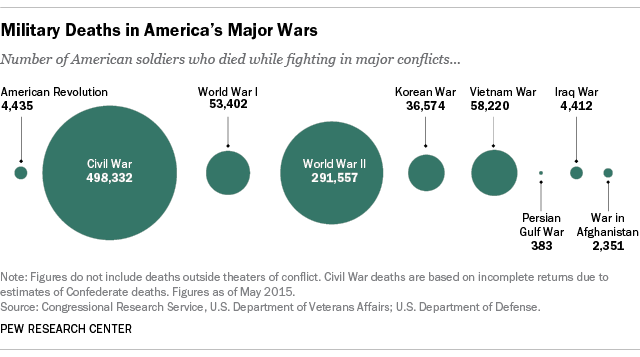 That number rises to 62% among soldiers who were in combat. 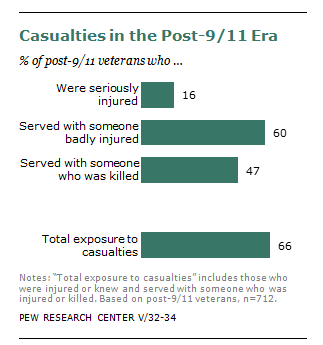 Service members who were seriously wounded or knew someone who was killed or seriously wound were more likely to say the wars were worth fighting. In the case of Iraq, 48% of these veterans said the war was worth fighting compared with 36% among those not exposed to casualties. For Afghanistan, the margin saying the war was worth fighting was higher — 55% to 40%. Exposure to casualties also had an effect on the emotional well-being of many veterans. Veterans who suffered their own injuries, or experienced the death or serious injuries of others, were more than twice as likely (54% to 22%) to say they had undergone an emotionally traumatic or distressing event during their service than those not exposed to casualties. Veterans exposed to casualties were also more likely to say, by 42% to 27%, that they suffered from post-traumatic stress. Note: This is an update of a post originally published on May 26, 2014.